Line plate or tray with waxed paper. Scoop ice cream into 8 (1/2-cup) balls onto waxed paper-lined plate or tray; place in freezer until hard, about 30 minutes. Meanwhile, in 12-inch skillet, melt butter over medium heat. Add crushed granola bars and pecans; cook 3 to 5 minutes, stirring constantly, until deep golden brown and most of butter is absorbed (mixture will look foamy). Spread in 13x9-inch pan; cool completely, about 20 minutes. Meanwhile, in 1-quart saucepan, heat all sauce ingredients over medium-high heat, just until mixture boils, stirring constantly. Reduce heat to medium-low; simmer 4 to 5 minutes or until candies melt, stirring frequently. Remove from heat. Pour sauce into glass measuring cup. Cool 10 minutes. Working quickly, remove 1 ice cream ball at a time from freezer; roll ball in crumb mixture, pressing mixture into ball until completely covered. Return to freezer until ready to serve. To serve, spoon 1 tablespoon cooled sauce onto each dessert plate. 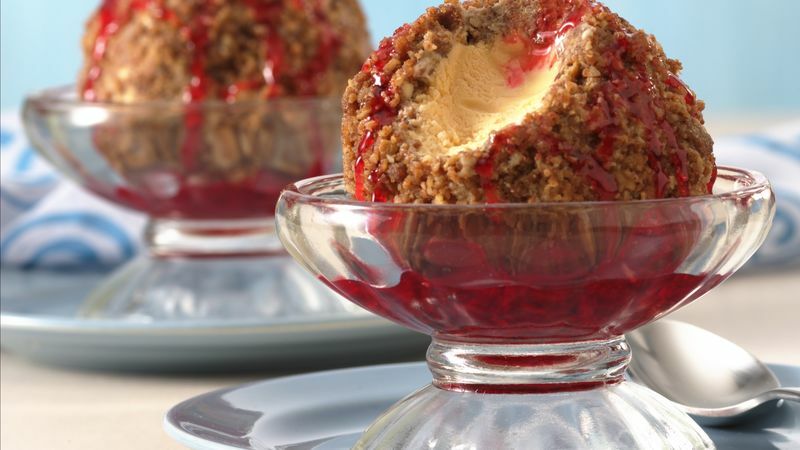 Place coated ice cream balls over sauce. Drizzle each with 1 tablespoon sauce, letting some run down sides (reheat sauce slightly if too thick to drizzle). Serve immediately.